When you meet someone that you are ready to marry, and spend the rest of your life with, you have to decide when and where to pop the question. When my husband proposed to me, we were at home. There was no sun, sand or sangria, no candle lit dinner but it was the second happiest day of my life, after my actual wedding day. Where you choose to propose to the one you love can play such a significant part in creating the right atmosphere. One of the most romantic settings in the world, Paris could be the perfect place for you to say, Je t’aime. It might not have the spender of the Eiffel Tower but it can have all the magic as you and your partner step out onto the Walk of Faith, where you can see wonderful views inland and over the Irish Sea. Like Paris, Venice has a reputation as being a city for love. Why not propose on a gondola while traveling down the Grand Canal? Go boating along the banks, or up river to Grantchester. Don’t try punting yourself as it’s far more difficult than it looks. You will have enough on your plate with trying to choose the right moment to pop the question. Book a private tour with a chauffeur punt instead, this way you can relax and take in one of England’s most famous colleges. There are three falls; the American Falls, the Bridal Veil Falls and the Canadian, Horseshoe Falls. All the falls are magnificent but I must confess while on honeymoon, I was overwhelmed by the Horseshoe Falls with its sheer power and beauty. England too has many of its own waterfalls. They may not be on the same scale of that of Niagara, but the Ingleton Waterfalls walk has some of the most spectacular waterfalls and woodland scenery in the North of England. The Empire State Building is one of the tallest buildings in the world. Why not re-create the scene from Sleepless in Seattle where Tom Hanks and Megan Ryan where united. The London Eye is the world’s largest observation wheel standing at a height of 135 metres. Hire your own private capsule and as you climb slowing into the sky ask your loved one to say I do. The Grand Canyon is the most famous natural attraction in the whole of the USA. The South Rim has the most popular visited viewpoints of the Grand Canyon so why not head for the North Rim, which is just as impressive and will offer you and your loved one with a stunning intimate view. Snowdon is the highest mountain in England and Wales, with superb views all around. If you are not keen on the 1085m hike then why not take the train to the top. 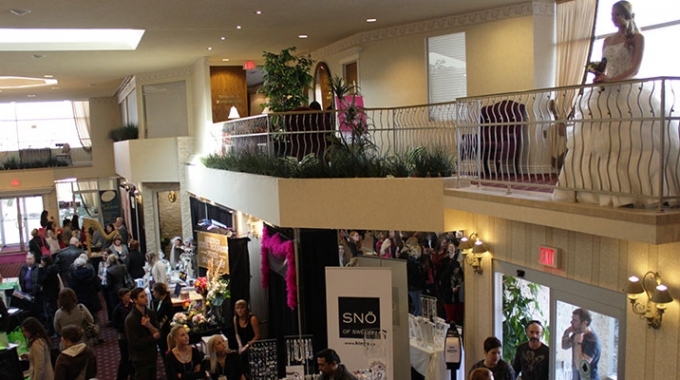 Why Attend a Bridal Show?